You know how much I love collaboration right? Well when Meg Biram emailed me about curating a gift guide for her magazine, To and From, she was doing with Katie for the holidays I just couldn’t say no. 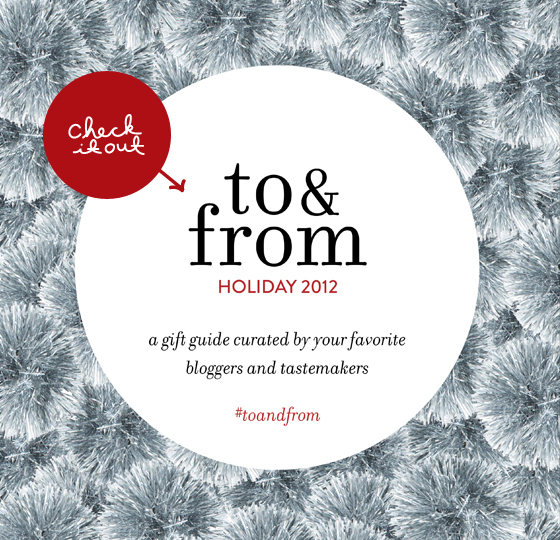 I loved the idea of bringing curated gift guides together in one place. Meg and Katie killed it on gathering all the gift guides, placing them in one place, and all the while making it extremely functional and beautiful for you all. I really suggest heading on over and first see if you can find me and a ton of your other favorite bloggers, but also find some great ideas for gifts. I know I plan to head back to the magazine and find some things for my dad and brother mostly because they are the hardest to shop for! Have you all started shopping yet? What is your normal gift giving traditions? I love this. Gift guides are one of my favourite parts of the holidays (even though I usually can’t afford anything on them). Thanks so much Megan! Loved having you be a part of to & from! You are so welcome!!!! I love what you guys did. I think it is brilliant!!! Neeeeat. Love the guides. And that backpack on yours – hmm…added to wishlist!